Hiking Rocky Mountain National Park: Bighorn Mountain in the winter. Due to the milder and less snowy winter, I have yet to really experience what I would call a 'true' winter hike this year- unbroken trail, windy, cold, plowing through knee deep or more snow. This week brought me the full value winter hike I've been wanting. I left the truck at the Lawn Lake TH at 640 on March 5. The going was pretty easy at first. Horseshoe Park in the early morning. The wind was already ripping. I could see footprints and tell that someone or someones else had been up this way recently, but when, hard to say. I did come across these very recent deer or elk footprints quite early on, always the reminder that this is their home and we just share it. Longs Peak and friends in the morning. Mummy range peaks, note the blown snow in the air above them. As instructed in the book, I took the trail until I met the sign for the Cutbank campsite. From here, the directions say to head directly southeast to avoid the steepest cliffs of the west face of Bighorn. Looking at the topo, this didn't sound quite right. It looked like heading SE from the campsite would take me directly up the steepest faces of the mountain. But what the hell, I went for it. 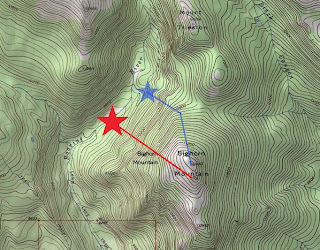 Suggested route in red, my suggested route in blue. My instincts were correct, as most of the way up I was on stuff that was at an inclination of at least 30 degrees, at up to 45 at times. Of course, in the summer this would be no big deal, but in the winter with snow it became a bit... sketchy. Breaking trail on the way up. The snow was at least knee deep at all times, up to waist deep. Which means that forward progress slowed to a crawl. At times I was taking four inch steps forward. And more up. Last year I bought Atlas 1230 snowshoes, and I am glad I had them for this hike. Snow conditions worsened the higher I got. I could feel my hiking poles hit the thin frozen crust of the top layer of snow, followed by six or so inches of powder, then another thicker and harder crust with tons of powder underneath. It was extremely disconcerting to see slabs forming in front of me at I worked my way up. Fortunately, nothing fell. After what felt like a long time, and alot of worry about the snow, I started to see the krumholtz that mark treeline, and soon after was on snow free tundra. I was overjoyed to be out of the danger zone, but still knew I had to get back down and would not be going the way I came up. Summit? It took me five hours and twenty minutes to get here. I am told the northern most point is the true high point and the wind was so strong I didn't even dare climb on top of it. I was having a hard enough time standing upright and moving forward. I found a windbreak and was able to get a few pictures of the Mummy range. I am looking forward to Mummy Kill at some point this summer with Dan. The end of the Mummy Range. To get back down, I basically followed the blue trail above. I tried to descend into the pass between Bighorn and Tileston, and then just head westish to get back to the trail. I was very worried about the snow, and kept a vigilant eye on things above and around me. Slowly I worked my way down. The terrain became less steep, and I was able to stop and have a snack. Yumyums on the mountain in the middle of nowhere. I happened upon the trail, but didn't realize it at first and was about to head down farther, when I stopped to take a look and realized, "Hey, I'm in an area that is four to five feet wide and goes in a straight line up and down." The trail. I headed down and did note that someone had been up this way before. With the wind it was hard to tell if they had been up as far as when I joined the trail, but I could see snowshoe prints. Back on the trail and thankfully headed down. I came upon this interesting part of the trail where ice had flown over it under the snow. And finally back at the sign for Cutbank. My tracks up on the right, and back on the left. I kept my snowshoes on for a bit before removing. I noticed that there seemed to be significant melt on my way back, and though I know we are not out of the woods yet, it may be an early spring season this year. Longs as seen from the trail. Looking down the Roaring River, with damage caused by the collapse of the Lawn Lake Dam in 1982. It's pretty mind boggling to see how much earth was moved by this flood. Forty to fifty feet gouged away in minutes. Back to Horseshoe Park in the afternoon. After nine long hours I made it back to the truck. I was happy to be back! I had originally planned for Mount Tileston as well, but since it took me so long to get Bighorn and snow conditions were not good, I decided to save it for another day. Actually, this is one I'd like to do in the summer to see how long it takes. My bet is that I could be on top of Bighorn within three hours and have both summits within five. That said, at this time of year, this is a very challenging hike. Plowing through the snow was a workout and a half! Bighorn Mountain: 3.9 miles one way, 2923 foot gain (8540-11463). Strenuous in winter conditions.